A man has been taken to hospital suffering from smoke inhalation after a tram he was testing on Blackpool promenade caught fire. The tram was undergoing a series of trials being carried out by Blackpool Transport when a fire started underneath the cabin on Wednesday. Fire crews from South Shore station were called out to tackle the blaze, which started shortly after 1600 GMT. 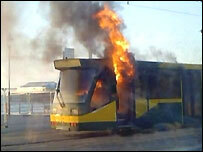 The single-decker tram suffered severe fire and smoke damage.